Our beer this week comes from a brewery that has played an important role in popularizing craft beer in the U.S. Like many other craft breweries, the Lagunitas Brewing Company has its origins in homebrewing. From a humble kitchen setup in Lagunitas, CA in 1993, founder Tony Magee worked his way up to a 15-barrel system within the space of two years, a system which he used to distribute throughout the San Francisco Bay Area. Within a decade, production increased to 32,000 barrels; today the brewery puts out around 600,000 and distributes to 35 states. Lagunitas expanded its capacity to more than twice that figure with the opening of a second site in Chicago in 2013, though the company says their goal is to prepare for greater demand rather than to grow as large as possible. Lagunitas has enjoyed remarkable growth over the last couple decades, reaching 11th largest overall in the U.S. last year. And yet the brewery has retained a distinctive personality over the years, thanks in part to the humorously offbeat labels designed by Tony Magee himself, as well as its lineup of hoppy, hard-hitting ales and an unapologetic fondness of cannabis. 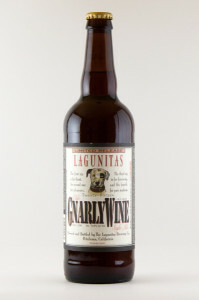 The featured beer this week is Lagunitas Olde GnarlyWine, a barleywine released once a year in February and March. While the name “barleywine” might seem confusing, it is in fact very fitting for a handful reasons. First of all, the style was originally created by English brewers during the Second Hundred Years’ War (1689-1815) to take the place of French imported wine. After the start of the war, English Parliament taxed French wine and brandy so heavily that imports virtually stopped. As a result, brewers turned to such ingredients as malt, molasses, and fruit to produce alcohol. Additionally, barleywine tends to improve with age like wine. Over time, the strong hop aroma fades while the malt sweetness increases and becomes more wine-like, resulting in a mellower, more complex character. Furthermore, because barleywine is often aged after bottling, some brewers include a vintage date on their products. 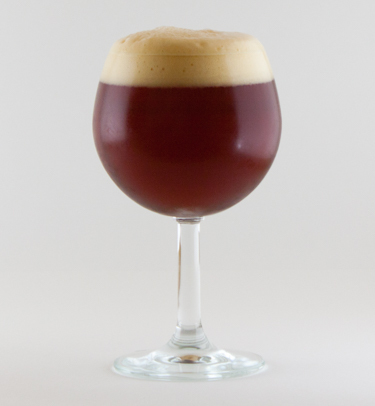 Yet another similarity is in the strength: barleywine tends to be brewed to an alcohol by volume of around 9-15%. Finally, barleywine shouldn’t be served too cold, as it is best sipped and savored rather than gulped down for refreshment. In order to reach high alcoholic strength, brewers increase the ratio of barley to water, thereby increasing the amount of fermentable sugar in the wort. The amount of malt can be three to four times that used in pale ale, for instance. Because there is so much sugar to ferment, barleywine takes longer to brew—around six weeks to two months, compared to three to four weeks for most ales. 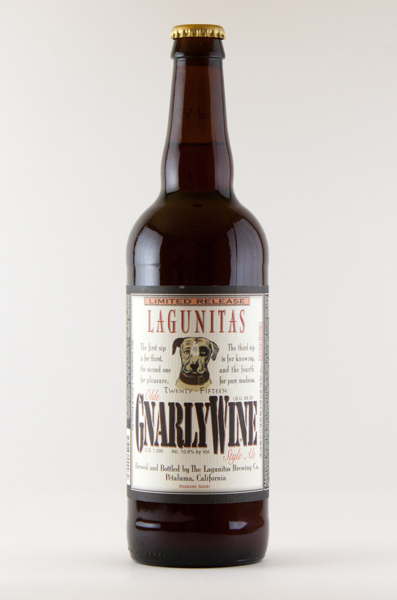 Lagunitas Olde GnarlyWine is deep burgundy in color and easily pours a light tan head. In the aroma is mostly pungent, herbal and citrusy hops along with some bread crust and taffy-like sweetness. The flavor is very rich, sweet, and bitter. The malt, especially at first, is roughly balanced with the hops and takes on a character reminiscent of bread and plums. The 10.6% abv is remarkably well hidden and adds to the warming sensation without being dry or boozy. Also in the flavor are juicy grapefruit and orange as well as a little smokiness. It’s creamy and full bodied; there’s not much carbonation but it still has some bite. It gets a little sticky after a while. The intense flavor is exceptional because of the balance between its rich, plummy malt and bitter, citrusy hops. Over time, the hops become predominant, but the strong hop presence nevertheless adds to the complexity of both the aroma and the flavor. The subtlety of the alcohol is astonishing. Overall, Olde GnarlyWine is ideal if you want rich, full-flavored malt and a good blast of bitter, citrusy hops to round it out. Today’s beer was purchased at Sake Taniguchi, located a short distance from Kita-senju Station in Tokyo. This entry was posted in American Beer, Mad Capper Reviews and tagged barleywine, GnarlyWine, Lagunitas, wine. Bookmark the permalink.